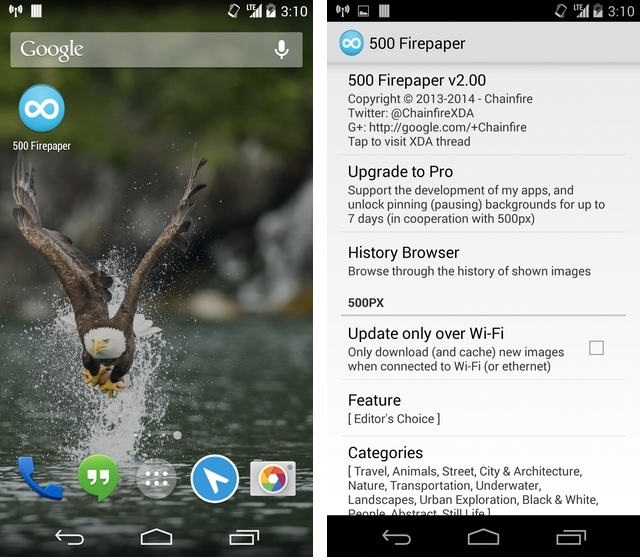 One of our favourite live wallpaper apps, 500 Firepaper, has received a nice update today. 500 Firepaper 2.0 adds hardware acceleration to its feature list, which makes loading and scrolling through one of 500px’s thousands of images smoother and more enjoyable. The new version also adds a Pro element. Chainfire, the developer of the app, worked with 500px to implement a premium version of its API, allowing for “pinning” or caching of individual images for up to seven days. The current API limit is 24 hours, which still applies for the free version. The Pro version, which should allow for more features in the future, costs $3.79 CDN. The app also plugs in with Muzei, the other recently-released live wallpaper app that has risen to popularity in the Android community. Live wallpapers, along with widgets, continue to be features that differentiate Android from other platforms, appealing to users who value customization.